canopies, small parts, and other model parts by vacuforming them. This box was created by public demand. 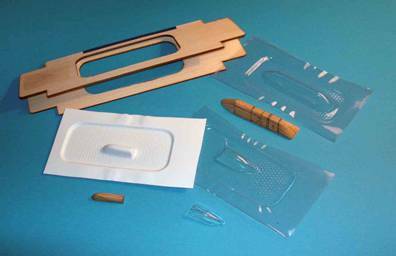 Modelers have asked and emailed about a smaller box specifically designed for building 1/48 & 1/72 aircraft canopies. So I have scaled the original Vac-u-Box down just for them with a 2" X 4" working area. 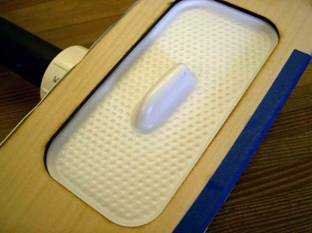 Vacuum-forming is something that requires some experience to do properly every time, but it is quickly learned. You will rapidly learn how much “sag” you need for any given combination of material and subject. 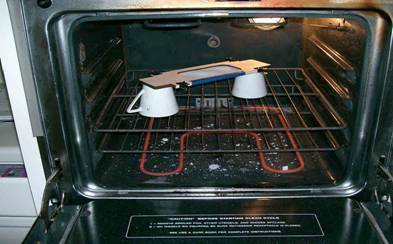 Further, if the object does not mold properly, the plastic can be simply be re-heated and used again. The Vac-u-Box can use any thickness of material, but anything over .030 requires a considerably longer heating time and could therefore cause the wooden frame to warp. Clear material (which is usually vinyl) needs less temperature than does styrene, therefore, it is ready to mold with less heating. Heat sources can include an normal oven, a heat gun (but be careful to heat the sheet evenly), or even a stovetop, but be very careful of the fingers, be sure to wear gloves, and remember that the Vac-u-Box is wooden. 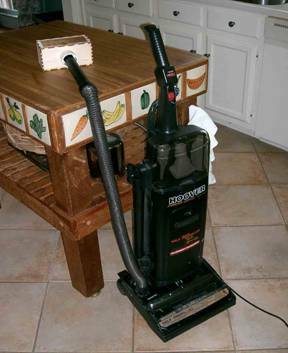 Virtually any vacuum cleaner that has a hose attachment can be used. If the hose does not make a tight seal, simply add masking tape around the hose wand until it does not leak. 1. Tape the two parts of the holder together along one edge. 2.Cut desired plastic into sheets roughly 4 inches by 10 inches. 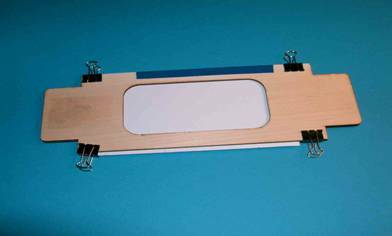 3.Using the small (3/4 inch) office supply clamps, clamp the plastic into the holder, making sure that it overlaps the hole on all sides. 4. Add about 1/8” spacer to raise the object above the bed to allow for proper forming around the base of the object. 5.Fix the object to be molded in the center of the perforated base of the Vac-U-Box using something tacky or simply double-folded tape. (This maintains its center position and prevents it being moved during molding). 6. Heat the plastic until it begins to sag evenly in the holder. 7. Turn on vacuum cleaner. 8. Using gloves, quickly pick up the holder and place it over the Vac-U-Box. Try to place it as centrally as possible. 9. Turn off vacuum cleaner and remove holder. 10. 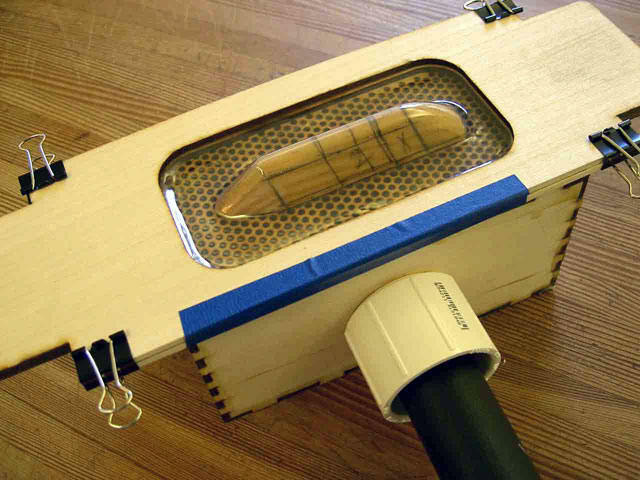 Open clamps and remove the molded object.